I’ve seen Method products on the shelf at my local Waitrose supermarket but Big Green Smile are the only place online that officially sells it and they kindly sent me a whole host of Method products to review. I first got busy with what is actually called ‘method stainless steel, streak-free, clean + polish’. Lovely stuff. I was actually going to give this to a friend to test as there’s only so much cleaning I can cope with, but I took a look at the state of our sink and draining board at home and thought I’d better give it a quick go. I’m not giving it up. The thing is, I love the look of the draining board and sink now, I’ve become obsessed with how clean it is, it’s lovely. But back to the beginning. Well there’s not much to say really but my sink was dirty so I gave it a clean. The directions suggested a soft cloth but as it was so dirty and scratched anyway I went with a rough cloth and boy, did it need it. I think I should have gone with a normal cleaner first as this isn’t something that gets ground on dirt off easily, it took quite a bit of scrubbing but it let a hell of a shine. I went with the soft cloth after and it’s brilliant and has given a whole new dimension to my washing up! I’m not joking I love it. I also didn’t use rubber gloves, I wasn’t bothered about getting it on my skin and I was fine, there’s no great smell to speak of so felt very comfortable spraying the fine mist onto the sink. I hope the rest of the Method range lives up to these results. Another thing I love is the packaging. Well, not the plastic, it is recyclable but there’s no getting away from plastic where chemicals are concerned, but the design of the bottle is great and the directions and writing is fun and helpful. All design and packaging should be like this, it almost makes cleaning fun. I bought my Method Stainless Steel Cleaner at Amazon.com, so it is available at other online places. But Big Green Smile sounds like a wonderful and more personal site. Sorry, I meant in the UK. In the US it’s much more widely available. 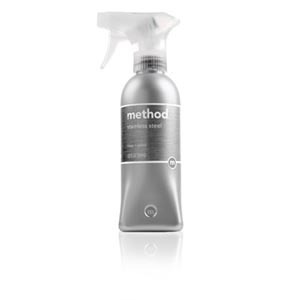 Don’t you have a problem with Method products smell? I am very chemically sensitive and the Method products I’ve tried (wood cleaner, hand soap) smelled very strong of fragrance to me-and not a subtle, essential oil smell-a “perfumey” smell. Just wondering if I’m the only one =that was bothered by this. The products I’ve used so far have had very mild smells and not really been an issue at all, in fact the soy candle I have has a very delicate and lovely smell. I’ll let you know though as I have plenty of things to test. I just tried the Method Stainless Steel wipes and LOVED them! They cleaned up the handprints on my stainless steel fridge and stove so well!! I noticed it says ” improved ” on it, so if people had tried before and weren’t happy, they may want to try again as I had no problems with this product shining up my stainless steel appliances – no streaks left ! !